Enjoy a full-on fix of desert fun on this 6-hour trip from Dubai. 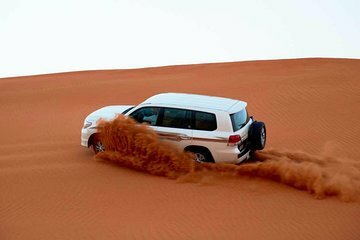 Take an adrenaline-pumping 4x4 dune bash, snap pictures of the desert sunset, and if you wish, surf down the sandy slopes on a sandboard. Visit a Bedouin-style desert camp, refuel with coffee and dates in a comfortable tent, and take your pick of activities including camel riding and henna tattoo art. As darkness falls, enjoy a succulent barbecue dinner complemented by belly dancing and swirling ‘tanoura’ dancing displays as you relax and absorb the magical desert setting. Great tour. Desert drive, sunset, nice driver, time to take pictures, well organised, great bbq and shows, well dosed, really worth. This is an absolute MUST. The pick up from hotel, our driver, the drive over the sand dunes, the BBQ in the village was AMAZING. Just seen the price we paid can't believe it was that cheap!! I honestly can not recommend this tour enough. I had a great time on this tour! The dune bashing was fun! It is not for the faint of stomach though! I was the only one in the group that signed up for sand-boarding so I felt that that was a bit rushed- I'd have liked to go down more than twice. The dinner / show were a nice way to finish off the evening. There was a wide variety of food. The dancers were ok, entertaining enough but nothing special! This is a fun day out for any age. Wow what a wonderful day! Our driver Mohammed was amazing. Nothing was too much trouble. Picked up at hotel and taken to our sand dune experience. Plenty of photo opportunities. Beautiful sunset watching, then onto a small 'souk' area for dinner and activities henna, camel rides, dressing up in traditional dress, souvenirs. Superb value for money! Highly recommend - would be mad to miss it!